With Holland America Line’s appointment of a dedicated director of social media last week, we look at a survey of travel agents on this subject completed by the American Society of Travel Agents earlier this year. Elswhere, with cruise seasons just finishing, the news is mainly from the ports. Vancouver will see a rise of more than 20% to more than 820,000 passengers next year, caused mainly by the return of the Disney Wonder. Boston set a record in 2012 with 380,000 passengers, brought about because of the arrival of the Carnival Glory for cruises to Canada. And Houston will be getting two new ships in 2013-14, with first the Caribbean Princess and then later the Norwegian Jewel. Last week, Holland America Line’s announced that it was appointing a newly created director of social media, with staff of two, to report to its vice president of marketing communications. The new role will include supervision of all the line’s Facebook, Twitter, YouTube, Pinterest and blog activity. Okay, so we all know that Carnival, Royal Caribbean and Norwegian like Facebook, and while the mass market lines have enlisted, not everyone has. But now even Holland America is having a look in. Is this a case of following to see what happens or does Holland America really think it might be useful?. Generally speaking, the higher you go on the food chain, the less likely it is that social media will play a big roll. But then kids get older too. Take physicians. Although they typically welcome new technologies, few have embraced the social media. A recent survey of 4,000 US physicians revealed that 85% do not use Facebook for work, while 92% do not spend time on YouTube and blogs and 97% don’t bother with Twitter. No attempts to build business there then. Meanwhile, the American Society of Travel Agents (ASTA) has conducted its own survey of 366 of its member agencies. ASTA suggests that agencies who want an online presence look at all of Facebook, Google+, Pinterest, YouTube, Instagram, Twitter and YouTube, or a mix of these according to needs, branded to the agency. But that all calls to action should point to the agency’s web site. In terms of marketing their own sites, ASTA found that 72% of agents use their business cards as the top way of advertise their Internet presence, followed by e-mail newsletters (55%) and social media (50%). Among the 80% of agencies that have web sites, 31% now have an online booking tool. However, the same agents report that only 8% of their revenue is booked directly on their web site, a share that has not increased in the past five years. Most agents (86%) say they use their web sites to provide an e-mail link to their agency, while 73% use it to identify their areas of specialisation. Many agencies, however, operate sub-accounts of a franchiser or host company’s main web site. This does not help them generate individual business and could even be counter-productive. If an agent doesn’t have the time and money to create an individual web site that will showcase their specific expertise, then a Facebook page might be an acceptable substitute. 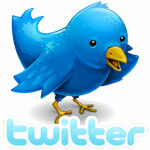 But again, not eveyone belongs to Facebook and that page will not always be found easily by search engines. Whether they think it’s essential or not, most agencies are active in social media of some kind. Almost half (49%) say they have used Facebook, while 44% are on LinkedIn. 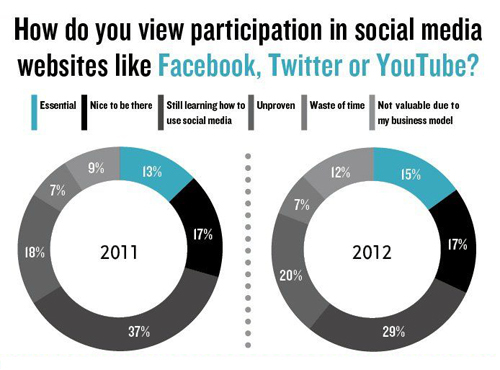 Only 24% do not use any social media. Social media usage varies widely depending on an agent’s affiliation. Part of the reason agencies in the ASTA study are not convinced about social media is that they do not see an obvious return on investment. Indeed, 86% say that they get fewer than five leads per month via social media. When asked what they considered the goal of their agency’s use of social media, 27% said it was awareness, general promotion and advertising, while more than 21% said it was to generate new business and expand the customer base. But in keeping with the direction of the survey, the largest group (28%) answered that where social media was concerned, they were not sure, or planning to develop goals. While clients aren’t buying much online from travel agencies, agents are booking quite a bit on supplier websites. This year, agencies estimate that 42% of the bookings they make are through supplier sites, a jump of 11 percentage points since 2006. Of the agencies surveyed, 76% say they have booked clients’ cruises on line with their suppliers, a figure that compares with 80% for flights..This is a huge change, however, as in 2005, only 47% had booked cruises on line. So, while 76% of American travel agents have booked cruises on line, only 15% consder social media to be essential. You can draw your own conclusions from that. The Port of Vancouver has concluded its 2012 Alaska cruise season, posting a modest increase in passengers to 667,000 compared to 663,000 in 2011. Between May and October, Vancouver’s two cruise terminals welcomed 28 different ships on 191 calls. During that season, sixty ships connected to the port’s shore power facilities, reducing greenhouse gas emissions by a claimed 2,266 tons. 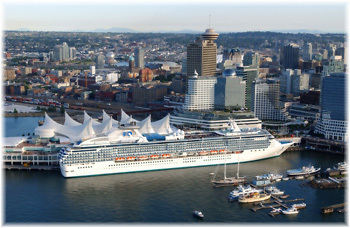 For the 2013 cruise season, Vancouver anticipates an increase of more than 20%, with more than 820,000 passengers. The port is looking forward to the return of four vessels in 2013: the 1,750-berth Disney Wonder, 2,002-berth Norwegian Sun, Oceania’s 684-berth Regatta and Holland America’s 1,380-berth Amsterdam. 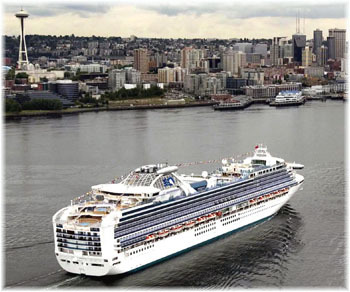 Meanwhile, Vancouver’s arch-rival Seattle saw a record 934,000 passengers pass through its cruise terminals in 2012. Across the Straits of Georgia, on Vancouver Island, Victoria is forecasting fewer cruise ships next year, expecting.211 ships carrying 466,000 passengers. That’s thirteen fewer calls than in 2012 and a decline of about 10,000 passengers. Victoria handled more than 500,000 passengers in 2012. and if more than double occupancy is achieved next year the actual number of cruise passengers could reach 490,000. The drop in calls will occur because the Disney Wonder will make Vancouver her home port in 2013, after having operated out of Seattle in 2012. Most Seattle departures use Victoria rather than Vancouver as their required foreign port of call to comply to US coasting regulations. Most people tend to forget that Boston was the original US terminal port for Cunard Line’s Transatlantic service in 1840, and that the ships also called at Halifax for the first quarter century of the line’s existence. Even London’s Sunday Times got it wrong yesterday by stating that Cunard had started its Southampton-New York service in 1840. In fact, the original UK terminus was Liverpool and the line’s first New York sailing did not occur until the Hibernia took the first sailing there in 1848. Last week, Boston announced that it had set a new record when it finished the 2012 season with 380,054 cruise vacationers, a 23% increase over 2011. Much of this growth was accounted for by Carnival Cruise Lines’ 2,974-berth Carnival Glory, which began cruising from Boston to Canada this June. With a dozen 4- to 7-day cruises from Boston to Canada in June and July, she contributed 85,000 passengers to the New England port’s yearly count. Many of the passengers came from outside New England, and extended their holiday by staying in local hotels and shopping and dining in Boston. 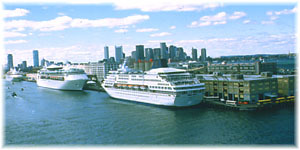 This year, 117 cruise ships docked at Boston, 9% more than 2011. Of that number, 63 used Boston as a terminal port for embarkation and/or disembarkation, with more than 274,000 passengers embarking in Boston. Another 54 cruise ships stopped in Boston for a day or more to allow their passengers to tour the city and surrounding areas. 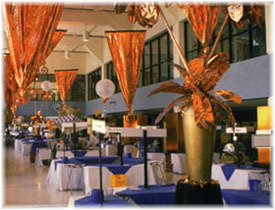 In 2010 Boston spent $11 million improving its cruise port, by adding a new 21,000 square foot departure lounge. This upgrade also gave Boston the ability to handle embarking and disembarking passengers simultaneously. In addition to Carnival Glory, Boston had new choices for Canada and New England cruises, including Holland America’s 1,348-berth Veendam, with 7-day sailings to Montreal and a positioning voyage to South America via the Panama Canal. The Veendam completed her last New York-Bermuda season this year and will return to Boston with an enlarged Canada and New England season next year. Canada and New England cruises more than doubled this year, growing by 119 percent. In 2013 Royal Caribbeans 2,112-berth Brilliance of the Seas will replace sister ship Jewel of the Seas sailing 7-day round trip Canada cruises; Carnival Glory will add two more 7-day Canada cruises; Veendam will add eight New England and Canada itineraries, and a 35-day Transatlantic voyage to Europe. Veendam will sail a 21-day repositioning cruise to San Diego via Panama, and the 2,476-berth Norwegian Dawn will sail additional Bermuda cruises in the month of October, after completing a series of Canada cruises, bringing her Bermuda total to 22 cruises..
During Tropical Storm Sandy, nearly 9,000 passengers also went to Boston on unscheduled ship visits when the Port of New York was closed to shipping.. The Port of Houston last week announced the arrival of two new cruise operations from Princess Cruises and Norwegian Cruise Line, who will both base ships there in future. Both ships will sail from Houston’s Bayport Cruise Terminal, which was completed in 2011. Princess Cruises will make turnaround calls during the 2013-2014 season, when the 3,114-berth Caribbean Princess moves to Houston from Galveston), while Norwegian Cruise Line will begin service in 2014. The Caribbean Princess begins sailing in November 2013, with 27 departures planned for the winter season. Princess Cruises’ inaugural cruise is in support of US veterans, which will sail between November 5 and 9, is expected to raise $1 million for the Vietnam Veterans Memorial Fund and Operation Homefront. 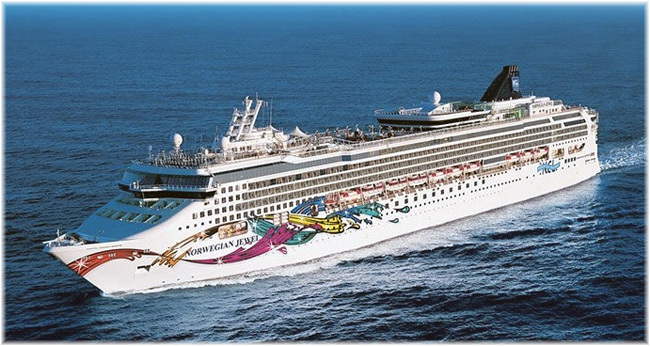 Norwegian will bring the 2,374-passenger Norwegian Jewel to Houston under a three-year agreement to sail seven-day Western Caribbean cruises. Beginning in 2014, the Jewel will perform a total of 75 calls over three years, and if successful there is an option to extend the agreement for a further two years. Norwegian is returning to Houston after an absence of seven years.